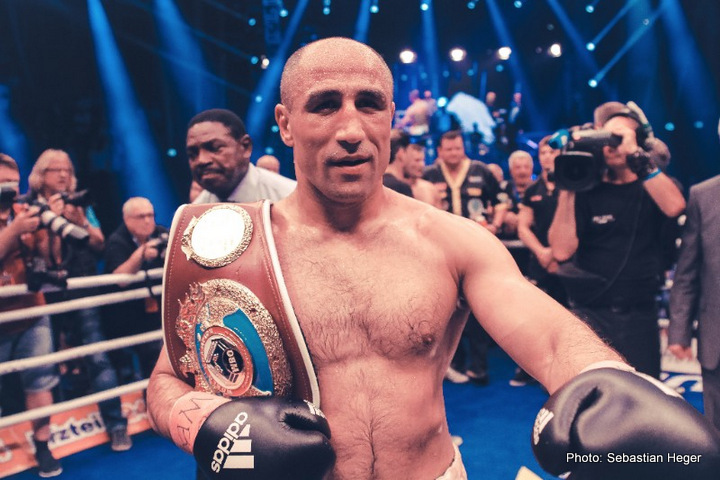 Arthur Abraham (46-5, 30 KOs) showed that he still has a little left in the tank in defeating Robin Krasniqi (46-5, 17 KOs) by a 12 round unanimous decision on Saturday night in their WBO 168 pound title eliminator in Erfurt, Germany. Abraham buzzed Krasniqi with a big power shot in round 6, and then never looked back in dominating the remainder of the fight against timid opponent. The scores were 118-110, 115-114, and 117-111. Krasniqi was out-landing Abraham by a fairly wide margin in the entire fight, but the power difference was the telling factor. Abraham’s shots landed with a thudding impact time they would connect, leaving no doubt who the stronger fighter was. Many of the shots Abraham landed in the fight knocked Krasniqi backwards a step or two. The 37-year-old Abraham no longer is capable of firing sustained combinations like he used to do when he was younger, but his power is remains better than ever. Abraham doesn’t appear to have lost any of strength. Krasniqi could not handle standing in the pocket against Abraham tonight. Whenever Krasniqi did try and stand and make a fight of it, Abraham would land a big shot that would sent him fleeing. Let’s hope that Abraham does better against WBO super middleweight champion Gilberto “Zurdo” Ramirez than he did last year when he lost to him by a 12 round unanimous decision. “I’ve prepared for half a year. It’s disappointing. But I’m not giving up,” said Krasniqi. Krasniqi is not a bad fighter, as he showed in this fight. He’s just not cut out for the 168lb. division. If Krasniqi could lose some weight and move down to 160, he might have a better chance of competing with the top fighters. He doesn’t belong at 168, because there are too many bigger punchers than him.